Ready for the Super Bowl? How about some nachos? How about some legendary nachos? 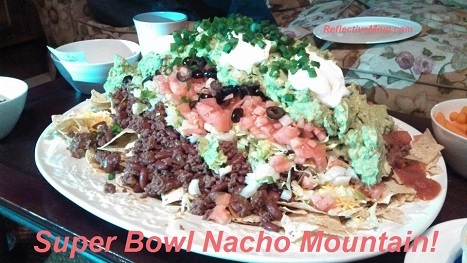 After you make these Super Bowl Nachos Mountain Supreme, your friends will ask you about it year after year! Now, this is the bravest culinary thing I had tried up to this point. And I thought it went well. The only caveat I’d add is that it doesn’t work that great to just have everyone “dig in” from the same plate. Better to serve up individual plates after the “wow factor” of presenting the world’s biggest pile of nachos on a turkey platter. These nachos aren’t just impressive…they’re good. Because of the Catalina dressing (er…high fructose corn syrup). And just so everybody knows…I don’t have those couches anymore. Just sayin’. Instructions: Brown the meat with one diced onion until all the pink is gone. Drain the fat and add 1/2 cup of Catalina dressing (or more to taste). Stir thoroughly while meat is still hot. (Optional: you can also add a taco seasoning packet to the meat.) Mix in kidney beans. Set aside. Pour bag of corn chips on large platter (I used a neutral colored turkey platter) and arrange so that the points of the chips are facing out toward the edges of the platter. Spoon piping hot meat and bean mixture over tortilla chips, spreading it out evenly so there is a good base for the mountain (there are a lot of ingredients). Sprinkle evenly with cheese. Layer lettuce over cheese mixture. Sprinkle chopped onion over lettuce. Drizzle lettuce and onions with more of the Catalina dressing. Top with tomatoes and olives. Spoon guacamole over the top of everything. Place three 1/4 cup dollops of sour cream over the guacamole. Sprinkle with green onions. Serves 10. Prep time approx. 35 mins. Serving size can be adjusted for the crowd. And a Nacho Mountain Supreme is something you can work up to. I didn’t go all out my first time. 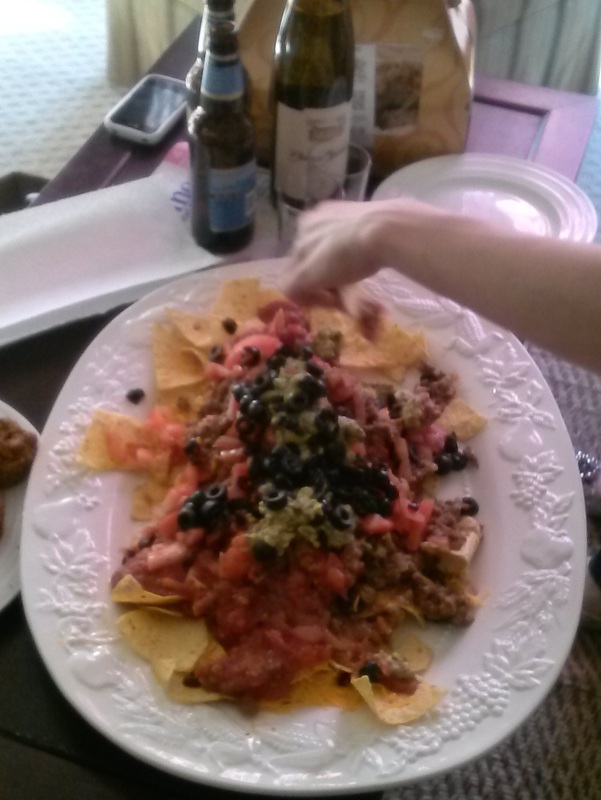 I call this my Baby Nachos Mountain. Instructions: Put the avocados in a non-metal bowl, cover with lime juice, and mash lightly with a fork. Mix with tomatoes and a cilantro. Season to taste. Don’t overdo the cumin. Tip: Don’t make either of these recipes in advance. If you know you’ll be pressed for time, prep all of the ingredients ahead of time (it’s amazing how much easier it is to throw together a recipe when you’ve gotten rid of the packaging, washed the vegetables, and sliced and diced). Also brown and drain the meat but keep warm. Don’t open the avocados because they start decaying and turning brown as soon as they’re exposed to air. Instead, this is a great recipe to be preparing just as your guests are arriving because it tastes better fresh. The fresh cilantro and lime really make it. And the bigger the party, the more people are going to want a “job” in the beginning. It helps break the ice. So have an extra apron or two handy and put your guests to work and let them feel like culinary geniuses by making the best most delicious guacamole ever! 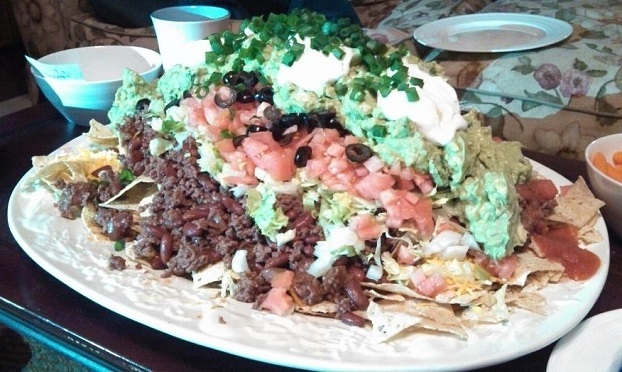 Or the world’s biggest nacho mountain. If you try this out, please take a picture of your “mountain” to share in the comments. I’d love it! Enjoy your nachos! And enjoy the Super Bowl. Why do Kids go crazy for pink Amoxicillin Suspension?